I first drew this figure on paper in perspective, a bit distorted. 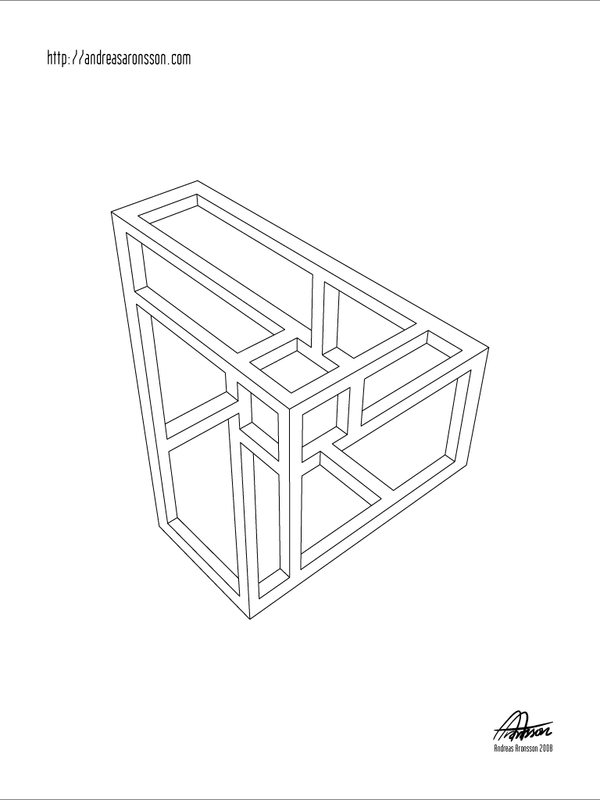 It was fairly complex so I decided I would draw it in an parallel projection to make it easier on the mind… bad idea. It was a great hassle to get the right lengths on everything, so I aborted that and went straight for the computer instead. This figure probably has the most complex chain reaction of proportional relationships between surfaces in any of my figures so far. I basically worked my way through the entire thing without stopping, as one edit lead to the next and so on. I also found that in the end the lines didn’t match, but through error location I found the two mistakes which had caused the oddness, as well as another minor glitch. I finished it after four hours of concentration. 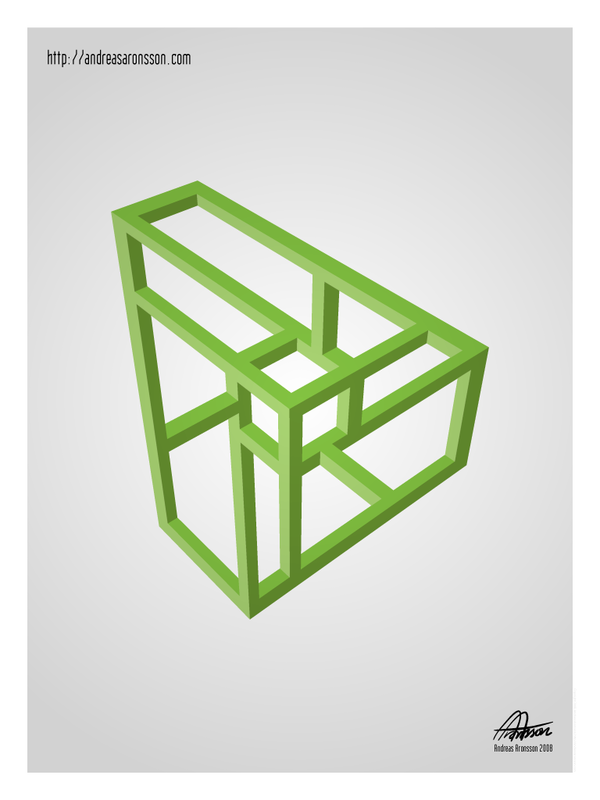 The outside of this figure makes up a traditional tribar structure, but embedded in the middle is a cube-ish framework. Between them there is a large amount of impossible connections. I screen recorded the entire process of this figure. I’ve been a bit indecisive about posting how I create these pieces as it’s something I feel fairly unique doing, but it is fun to share. Hopefully it takes a bit of skill and motivation that is uncommon to make these creations. Below is the video embedded, but to view it in fullscreen you might have to head over to Youtube! This entry was posted in Illusions and tagged Art, Impossible Figure, Three Point Perspective, Video. Bookmark the permalink. Wuts that 3D-modeling software you be using? It’s Google SketchUp, you can find it here: http://sketchup.google.com/ I suggest watching a few videos on their site to see how user friendly it is. The app is nowhere near a professional 3D-application but it does what I need it to do. What made me choose it was it’s incredible ease of use as I wanted to get going quickly after I had decided I should use a 3D tool to start my figures with. They do have a pro version that costs money, but yeah, they could implement a few more features for more advanced users :) But then it would become a professional 3D app instead of a sketchy one that is instantly easy to use, so uh, who knows :P Perhaps it’s good if it stays simple. this is pretty amazing. 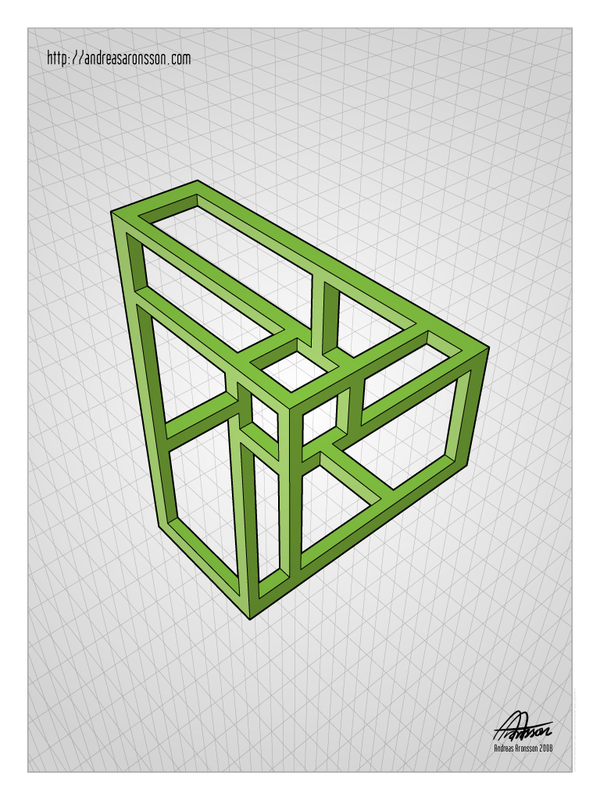 thanks for the insight on creating your intriguing impossible figures, i really enjoyed it. I appreciate your work and creativity. I am researching the the impossible figures, so thanks for sharing your process. Thank you Mgd :D If you have any questions or if I can help out in any way just send me an email via the contact form :) Cheers! Thank you very much for sharing your experiences in the creation of impossible figures. Very nice Ricardo :D I find it interesting that you also use AutoCad, I wouldn’t have thought that, mostly because I didn’t think I would use it myself! Clearly it has some nice qualities :) Cheers!